Guwahati, Jun 5 : The situation on the Assam-Nagaland border in Assam's Jorhat district continued to be tense Tuesday and forces were deployed after the killing of a labourer there Monday, an official said. The man was killed at Naginijan area after suspected miscreants from the Nagaland side fired on a group of labourers. Local groups, including the All Assam Tea Tribe Students Association (AATTSA), started an indefinite economic blockade Tuesday at three places along the Assam-Nagaland border in Jorhat, Sivsagar and Golaghat, protesting the killing. The blockade left many Nagaland-bound trucks stranded on the Assam side. The Assam government has deployed additional forces along the border in the area, particularly in Mariani area, to stop recurrence of similar incidents. "There has been no fresh incident since yesterday (Monday). 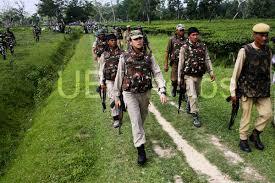 We have deployed additional forces in and around the area," said an official of Jorhat district. The Assam government has announced an ex-gratia payment of Rs.5 lakh to the next of kin of Sanjay Bhumij, who was shot dead. Assam Chief Minister Tarun Gogoi said the Nagaland government has assured the state government to book the culprits involved in the killing and that they would be handed over to Assam Police soon. A delegation of Assam's opposition party Asom Gana Parishad (AGP) visited the Mariani area Tuesday and took stock of the situation. The AGP, which protested outside the office of Jorhat deputy commissioner Tuesday, submitted a memorandum to Assam Governor J.B. Patnaik demanding an inquiry into the incident and punishment for the culprits.